Although Judah has experienced wicked kings before this point, King Ahaz leads the southern nation of Judah into unprecedented evil. Ahaz’s father, Jotham, was a godly king who did what was right in the eyes of Yahweh (apart from leaving the high places in Judah; 2 Kgs. 15:34–35), but Ahaz pushes the nation to a new level of wickedness. First, King Ahaz goes beyond the wickedness of the previous kings of Israel and Judah to the point of sacrificing his own son “according to the despicable practices of the nations whom the LORD drove out before the people of Israel” (2 Kgs. 16:3). Now, while Abraham had also attempted to offer his son Isaac as a sacrifice (Gen. 22), it is important to recognize that the two acts were fundamentally different. 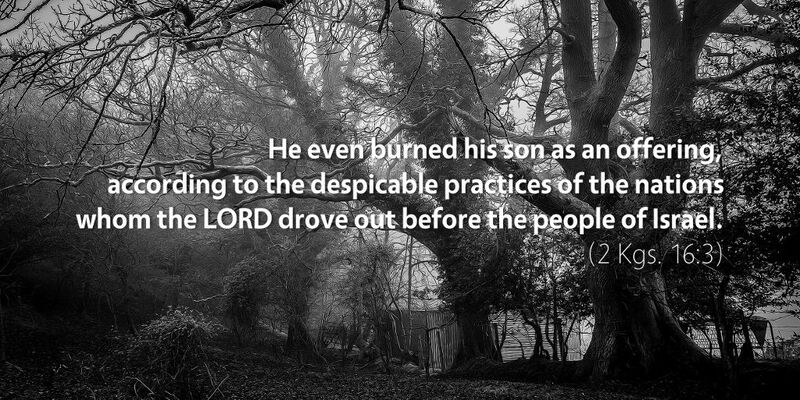 Abraham nearly sacrificed Isaac out of obedience to Yahweh, stopping when an angel commanded him to stop. Ahaz, on the other hand, willfully sacrificed his son in direct disobedience to the law of Yahweh (Deut. 18:10), following instead the vile practices of the surrounding nations. Second, Ahaz systematically corrupts, pollutes, and disassembles Yahweh’s temple. So, when the kings of Syria and of Israel join forces to come up against Jerusalem (2 Kgs. 16:5), Ahaz seeks out an alliance with Assyria, offering silver and gold stolen from the temple (2 Kgs. 16:8–9). Then, when Ahaz visits the Syrian capital of Damascus to meet Tiglath-pileser, the king of Assyria, Ahaz replaces the bronze altar Yahweh had given his people with an altar that the Syrians used in their worship (2 Kgs. 16:11–14). Finally, Ahaz continues his defiling of the temple by removing frames from the basin and by replacing the bronze oxen on which the sea sat with a stone pedestal, as well as changing the external entrance into the temple “because of the king of Assyria” (2 Kgs. 16:17–18)—that is, either as a part of paying off the king of Assyria to fight against the Syrians, or worse, to allow the king of Assyria to use the temple of Yahweh for his own purposes. There is a fascinating inverse story to Ahaz’s, however, contained in the New Testament. There, Yahweh hands the temple of his own Son’s body over to be defiled and destroyed at the hands of wicked men, and he does so while offering up that Son as a once-for-all sacrifice for his people. The difference between Ahaz and Yahweh, then, comes in the way that Ahaz sought spiritual power by embracing the culture of death and idolatry of the surrounding nations, while Jesus Christ came to enter fully into death not because he loved it but because he hated it and came to destroy it forever. Therefore, choose the life that is in Christ, “that you and your offspring may live” (Deut. 30:19).